Hello, Friends Today we are discussing the new Launch smartphone Xiaomi Redmi Note 7 Faqs. Does Xiaomi Redmi Note 7 comes with Metal body or plastic body? Answer: The Xiaomi Redmi Note 7 handset comes in glass on both Front & back along with plastic frame which makes it look very eye-catching and elegant. Round curved edges give nice grip in hands which reduce the chance to drop down. Does Xiaomi Redmi Note 7 Feel Bulky? Answer: it has 186 Gram and weight distribution is good. Does Xiaomi Redmi Note 7 have a headphone jack (3.5mm)? Answer: Yes, it comes with 3.5 Audio Jack. Does Xiaomi Redmi Note 7 have USB Type C Port? Answer: Yes, it has USB Type C Port which is good. Does Xiaomi Redmi Note 7 have dedicated Memory Card Slot? Answer: No, It comes with Hybrid Sim Slot, which means you can either use 2 Sims or 1 Sim and Memory card at the time. Does it come with Removable battery? Answer: No, it has a Non-Removable Battery. Answer: Battery capacity is 4000 mAh. Answer: Xiaomi Redmi Note 7 does support fast charging. Does it come with notification light? Answer: Yes, the phone comes with a notification light. What kind of Display Panel is used? 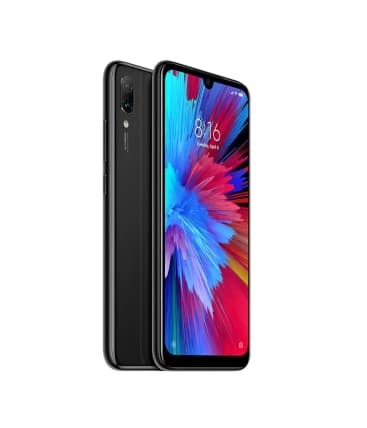 What is the aspect ratio on Redmi Note 7? Does Screen come with any protection? Answer: Yes, gorilla glass protection available. it comes with Corning Gorilla Glass V5 protection. How is the Sunlight legibility? Answer: The Sunlight Legibility is Good, No issues under direct sunlight. Does it come with Fingerprint Scanner? Answer: Yes, it comes with Fingerprint Scanner at the back side. What is the camera specification? Answer: The Smartphone packs with 12 MP, f/2.2, 1/2.9″, 1.25 micrometer, PDAF + 2 MP, f/2.4, depth sensor and carries features like Geo-tagging, touch focus, face/smile detection, HDR, panorama. At the front, there is a 13MP sensor for selfie experience. Does Redmi Note 7 Have Front Flash? How Much Memory & RAM we Get? Answer: 3GB/4GB RAM along with 32GB/64GB respectively which can be expandable up to 256GB. Answer: It comes with Android 9.0 (Pie) OS with MIUI 10 out of the box. Where Can I Buy it and what is the starting Price? Answer: It is available on Flipkart with starting variant price is Rs 9,999. I tried to answer most ask questions about Xiaomi Redmi Note 7 if anything I missed please mentioned in the comment.